(Nanowerk News) A simple new technique to form interlocking beads of water in ambient conditions could prove valuable for applications in biological sensing, membrane research and harvesting water from fog. Researchers at the Department of Energy’s Oak Ridge National Laboratory have developed a method to create air-stable water droplet networks known as droplet interface bilayers. These interconnected water droplets have many roles in biological research because their interfaces simulate cell membranes. Cumbersome fabrication methods, however, have limited their use. Instead of injecting water droplets into an oil bath, the ORNL research team experimented with placing the droplets on a superhydrophobic surface infused with a coating of oil. The droplets aligned side by side without merging. To the researchers’ surprise, they were also able to form non-coalescing water droplet networks without including lipids in the water solution. Scientists typically incorporate phospholipids into the water mixture, which leads to the formation of an interlocking lipid bilayer between the water droplets. 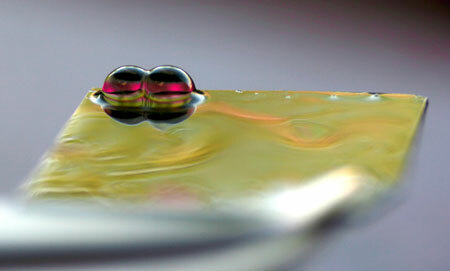 The team’s research revealed how the unexpected effect is caused by a thin oil film that is squeezed between the pure water droplets as they come together, preventing the droplets from merging into one. Watch a video of the process on ORNL’s YouTube channel. With or without the addition of lipids, the team’s technique offers new insight for a host of applications. Controlling the behavior of pure water droplets on oil-infused surfaces is key to developing dew- or fog-harvesting technology as well as more efficient condensers, for instance. “Our finding of this non-coalescence phenomenon will shed light on these droplet-droplet interactions that can occur on oil-infused systems,” Boreyko said. The ability to create membrane-like water droplet networks by adding lipids leads to a different set of functional applications, Collier noted. The team’s study also demonstrated ways to control the performance and lifetime of the water droplets by manipulating oil viscosity and temperature and humidity levels. Coauthors include ORNL’s Georgios Polizos and Panos Datskos, and the University of Tennessee’s Stephen Sarles. The researchers have filed an invention disclosure on their technique. This research was conducted at the Center for Nanophase Materials Sciences, which is sponsored at ORNL by the Scientific User Facilities Division in DOE’s Office of Basic Energy Sciences. Funding was also provided by an Air Force Office of Scientific Research Basic Research Initiative grant and the SunShot Initiative within DOE’s Office of Energy Efficiency and Renewable Energy.